After just missing out on promotion the previous season by a single point, hopes were high that Vale could celebrate their centenary year in 1991 by regaining their place in their place in the East of Scotland Premier Division, but it initially looked unlikely as they lost their first three league games. Results soon picked up though, and in a very tight division with only two points separating the teams from second to sixth place, Vale managed to squeeze themselves into the second promotion spot ahead of Eyemouth United on goal difference. However, the club’s biggest achievement of the season was winning the Scottish Qualifying Cup for the fourth time in their history. Tarff Rovers visited Innerleithen in a Second Round match and were on the receiving end of a 7-0 drubbing. A trip to Premier Division high flyers Gala Fairydean awaited in the next round and despite being obvious underdogs, Vale triumphed 2-1 to ensure participation in the Scottish Cup. It also set up a Semi Final meeting with Whitehill Welfare, in which Vale were much the better side on the day and an early goal at Rosewell helped Vale towards a 5-2 win. Spartans had won 4-3 against Threave Rovers at Castle Douglas to reach the Final, which was set for the 24th November at Galashiels, and proved to be a real classic. Both teams set out to play football, with almost an hour of play gone before the referee had reason to award a foul. Vale opened the scoring through Charlie Spence and later Stevie Mitchell picked up a throw-out by goalkeeper Tom McDermott and sped almost the full length of the pitch up the right-hand side before cutting inside and blasting home a superb shot with his left foot. It was a goal fit to win any cup final, but just before half time Spartans’ ex-Hibernian player Colin Campbell took advantage of a defensive slip in the Vale area to reduce the leeway. The second half was a feast of football as play swung from end to end and with eight minutes remaining, Campbell struck again for Spartans to bring the score level. With extra time looking certain, Vale got a lucky break as Spartans’ defender Carney needlessly fouled substitute Gavin Selkirk in the area and the referee awarded a penalty. Graham Ross stepped up to take the kick and made no mistake from the spot with a perfectly placed shot to give Vale the trophy. The victorious Vale team that day was; Tom McDermott, Graham Ross, Colin Graham, Stevie Bird, Ian McNaughton, Chris Lynch, John Thorpe, Stevie Mitchell, George Hogarth, Charlie Spence and Jock Taylor, with substitutes Gavin Selkirk and Andy Waddell. Vale’s triumph in the competition was especially merited as, despite being a First Division side, they had beaten the top three teams in the Premier Division, Gala Fairydean, Whitehill Welfare and Spartans, away from home. The Scottish Cup draw saw a trip to Highland League Fraserburgh and the game on 8th December, in front of an 800-strong crowd, was played in near-hurricane conditions which badly affected the flight of the ball. In such circumstances almost anything could have happened, but the players of both sides coped admirably, with the score 1-1 at half time, before two further goals for the home side saw them through to the next round. Weather conditions were no better further south and the journey back saw the Vale party fortunate to make it back to Innerleithen through heavy snow. Highlights from the game had been shown on television, but the severe weather had knocked out television reception in the area. Back in the Premier Division for 1991-92 season, Vale achieved a respectable third place finish in the top league, which ended up consisting of 9 teams after Berwick Rangers resigned from the league in December and their results were expunged from the records. Season 1992-93 saw Vale lift the Scottish Qualifying Cup for the fifth time. A 6-2 win over Annan Athletic set up a Quarter Final meeting with Girvan and Vale qualified for the Scottish Cup proper with a 2-1 victory. The Semi Final was a thumping victory over Spartans, with Ian McNaughton, Elliot Gray, John Thorpe, George Hogarth and Neil Nisbet all on target to record a 5-0 win. The final was again at Galashiels, with Gala Fairydean the opposition. Despite it being a ‘home’ game for ‘Dean, doubles from Elliot Gray and John Thorpe ensured that the trophy made it’s way back to Innerleithen, although celebrations were slightly tempered by the fact that captain Stevie Bird had been taken to hospital after an accidental collision in the 28th minute of the game had left him with a broken leg. The winning team was: Ricky Clarkson; Dale Finlayson, Graham Ross, Stevie Bird, Graham Shearer, Neil Nisbet, John Thorpe, Stevie Mitchell, David Brown, Elliot Gray, and Gavin Selkirk. Subs: Ally McCulloch and Lindsay Rathie. The draw for the Scottish Cup First Round paired Vale with East Stirling and the game at Victoria Park ended 2-2, but in the replay the Scottish League side edged Vale out 3-2. At the time, the Tennant’s Indoor Sixes was a popular competition during the winter, where all the biggest clubs in senior football fielded teams. Vale found themselves part of it as Scottish Qualifying Cup winners, playing in a special challenge match against Huntly, who had won the Scottish Qualifying Cup North. The goals flew in as Vale managed to get the better of their Highland League opponents 10-5, with the goals coming from John Thorpe (4), Elliot Gray (2), Graham Ross, Gavin Selkirk, Stevie Mitchell and Billy Cormack. Season 1993-94 mainly saw Vale playing second fiddle to Whitehill Welfare, who were dominating the East of Scotland League at that time. In the Confederation Life East of Scotland League Cup section, despite winning home and away against both Eyemouth United and Heriot-Watt University, a draw at Rosewell and a loss in Innerleithen saw Whitehill pip Vale into the knock out stage. In the Scottish Qualifying Cup, a win over Wigtown & Bladnoch in the Second Round was followed by Vale going head to head with Whitehill for a place in the Scottish Cup First Round. After a scoreless draw in Innerleithen, the replay at Ferguson Park saw Whitehill triumph 3-1. In the East of Scotland League too, Vale finished second behind the Rosewell men, who almost made it a clean sweep of East of Scotland trophies, losing only the League Cup final on penalties to Gala Fairydean. In season 1994-95 Vale stuttered to a mid-table finish and there was no Scottish Cup participation after St Cuthbert’s Wanderers ended Vale interest in the Qualifying Cup in the Second Round. The highlight of the season was the run in the Image Printers East of Scotland Qualifying Cup. A Second Round win over Pencaitland put them into a Semi Final meeting with Kelso United, in which the first match was drawn, but a 3-0 victory in the replay back at Innerleithen saw Vale into the final against Gala Fairydean. The Final was set for Tuesday 11th April, but Vale objected to the date, as work commitments for various players meant that they would be unable to field a full-strength side. The East of Scotland Association were unsympathetic to Vale’s plight and threw them out of the competition, with defeated semi-finalists Kelso taking their place. Season 1995-96 saw the East of Scotland League introduce three points for a win and ruled for the first time that players were required to wear numbers on the back of their shirts. It was a year of significant change for Vale too. The team that had been so successful in the early part of the decade had broken up, with the prolific goal scoring of John Thorpe badly missed in particular. Following the events of the previous season, the club were handed a one-year ban from the Image Printers East of Scotland Qualifying Cup and little progress was made in the other cup competitions. Behind the scenes there was change, with chairman Willie Brunton and secretary Dougie Barnett resigning their positions amid a financial crisis. The position of Chairman was taken by Ken Brown, a native of Kirriemuir, Tayside, who had arrived in the town a few years previously and played for Leithen Rovers. The new Secretary was Alex Currie, who had family connections with the club as both his father and grandfather had played in goal for Vale. With the team struggling badly in the Premier Division, there was change of management too, as Mervyn Jones resigned. His replacement was former player Stuart Robertson, who had already picked up plenty of management experience at East of Scotland level with Border clubs Hawick Royal Albert, Kelso United and Peebles Rovers. Being a local man, Robertson was under no illusions about how badly things had slipped, but if he had been, his first match in charge made it clear. Despite looking certainties for relegation after recording just three league victories, Vale went into their final game at home to Whitehill Welfare – who were already assured of the championship – knowing that even a point would see them climb above Edinburgh University to survive in the top division. But it wasn’t to be as Vale crumbled and Whitehill ran riot to record a whopping 10-0 victory. Back to being a First Division side for 1996-97, Vale got off to a great start by topping their League Cup section at the expense of Premier Division sides Gala Fairydean and Craigroyston. They would have done it more comfortably if the home match against Craigroyston hadn’t been abandoned with Vale leading 3-0. The rearranged game saw Craigie triumph 2-1, but the final game at Netherdale saw Vale beat Fairydean 3-1 to top the group by a point. Goals from Jackie Diamond and Lenny Rathie against Pencaitland in the semi final saw Vale into the final, but at Pennypitt Park, Prestonpans, Whitehill Welfare were again Vale’s nemesis and a 2-0 win saw the Rosewell men lift the cup. There was disappointment as Vale exited the Scottish Qualifying Cup at the hands of Hawick Royal Albert after a replay, Craigroyston ended their interest in the King Cup at the first hurdle and who else but Whitehill Welfare put them out of the Image Printers East of Scotland Qualifying Cup in the first round. A mid-table finish in the First Division was respectable after the upheaval of the season before. Season 1997-98 saw the arrival of a new folk hero at Victoria Park – striker Peter Moffat was signed from Dalkeith Thistle and netted twice in his first competitive game against Heriot-Watt University, before going on to score a total of 27 goals in all competitions. 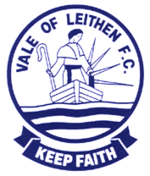 Moffat was on target, along with Lindsay Rathie, as Vale defeated St Cuthbert Wanderers 2-0 in the first round of the Scottish Qualifying Cup. The second round draw paired Vale with Threave Rovers, but the game at Innerleithen failed to produce any goals. The replay a week later at Meadow Park saw Vale win 3-2 thanks to goals from Ryan Curran, Alan Notman and, of course, Moffat to set up a third round meeting with Civil Service Strollers. In a tight game at Victoria Park there wasn’t much to choose between the sides, but by the final whistle a goal from Jackie Diamond separated the sides and Vale had qualified for the Scottish Cup proper for the first time in six years. Vale suffered a 3-0 reverse at the hands of Whitehill Welfare in the Qualifying Cup semi final, but received a bye in the first round of the Tennent’s Scottish Cup before being handed an away draw against fellow East of Scotland League side Annan Athletic.